A top official was sacked over revelations that the order’s charity branch distributed tens of thousands of condoms in Myanmar under his watch. THE KNIGHTS OF Malta, the ancient Catholic lay order, is refusing to cooperate with a Vatican investigation into the sacking of a top official over a condom scandal — and is warning its members to toe the line if they choose to speak with investigators. In a statement yesterday, the Knights called Pope Francis’ investigation legally “irrelevant” and aimed at limiting its sovereignty. It insisted that the ouster of its grand chancellor, Albrecht von Boeselager, was an act of internal governance that in no way involves religious superiors. The order told its members that if they speak with Vatican-appointed investigators, they cannot contradict the decision of the order’s leadership to replace Boeselager. Boeselager was suspended on December 8 after he refused a demand by the top Knight, Matthew Festing, to resign over revelations that the order’s charity branch distributed tens of thousands of condoms in Myanmar under his watch. Church teaching forbids the use of artificial contraception; Boeselager has said he didn’t know about the condom distribution program and eventually stopped it when he learned of it. Boeselager has said Festing — in the presence of conservative Cardinal Raymond Burke — indicated that the Holy See wanted him to quit. But the Vatican’s secretary of state, Cardinal Pietro Parolin, has since said the pope wanted no such thing. Burke, who is a top critic of Francis’ but also the pontiff’s ambassador to the Knights of Malta, is a hardliner on enforcing church teaching on sexual morals. 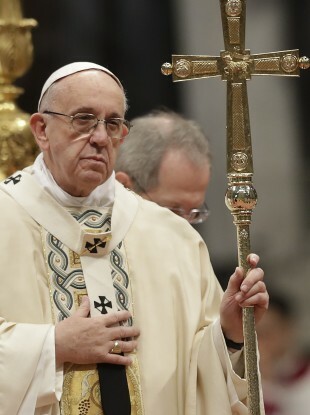 As a result, the dispute in some way reflects the broader ideological divisions in the Catholic Church that have intensified during Francis’ papacy, which has emphasised the merciful side of the church over its doctrinaire side. In a more narrow sense, though, the scandal within the ancient aristocratic Catholic group is about a power struggle and the possibly questionable application of promises of obedience within a religious order. As a second-class knight, Boeselager promised obedience to his superior. But Boeselager has said church law doesn’t require him to obey an act that violates the Knights’ own constitution. He maintains that Festing committed a series of legal and procedural errors in demanding his resignation that violated the order’s constitution. Festing and Burke’s allies have justified the ouster by arguing that Boeselager’s refusal to obey Festing was “disgraceful” and that the condom scandal represented an irredeemable breach. The conservative, anti-abortion Lepanto Institute, for example, compiled a detailed dossier of United Nation’s reports that showed the order’s Malteser International group distributed thousands of condoms through anti-HIV and family planning programs. Members sympathetic to Boeselager, meanwhile, have denounced what they consider a coup and reminded Festing that he, too, took a vow of obedience: to the pope. They welcome the Vatican’s investigation, but canon lawyers have cautioned that the sovereign nature of the Knights of Malta makes Vatican intervention problematic. The Order of Malta has many trappings of a sovereign state. It issues its own stamps, passports and license plates and holds diplomatic relations with 106 states, the Holy See included. The knights trace their history to the 11th century with the establishment of an infirmary in Jerusalem that cared for pilgrims of all faiths. It now counts 13,500 members and 100,000 staff and volunteers who provide health care in hospitals and clinics around the world. Email “Knights of Malta refuse to assist in Vatican investigation over condom scandal ”. Feedback on “Knights of Malta refuse to assist in Vatican investigation over condom scandal ”.